For architects attending the AIAri “Composites in Architecture” symposium in July, this day-long event was an eye-opener — demonstrating the potential of composite materials and the breadth of composites expertise resident in Rhode Island. Organized at Roger Williams University by the R.I. chapter of American Institute of Architects (AIAri) in concert with the Composites Alliance, the event included presentations by technical experts and academics. There were also opportunities for attendees to socialize and tour local firms Symmetrix Composite Tooling and Goetz Composites. In an opening keynote talk Dirk Kramers of SDK Structures, who was chief engineer for Oracle’s victorious America’s Cup defense in 2013, gave an overview of the high-performance qualities of composites used in competitive sailing, and he concluded with a sentiment repeated throughout the day: architects should expand their creative palette and consider composites early in their design process, for the materials may lead them to new solutions. Michael Mulhern of TriPyramid Structures, who prior to founding TriPyramid designed rigging hardware for yachts at Navtec, walked the audience through the creative solutions his company has executed in their work, including the tension rod support system used on the I.M. Pei-designed glass pyramid at the Louvre in Paris. A panel of experts — including JP Mouligne of Gurit USA, Eric Goetz of Goetz Composites, Roger Williams Assistant Professor of Architecture Nate Fash and moderator Bob Lacovara of IYRS — gave attendees an overview of composites and their use in architecture and also answered questions from the audience. Mouligne walked attendees through a “Composites 101” presentation, briefing them on fibers, fabrics, resins and cores; Goetz talked about projects done at his company, including the restoration of the Buckminster Fuller’s Fly’s Eye Dome; Fash looked at a wide range of projects—from furniture to the pioneering work of Zaha Hadid. The panel was particularly helpful in answering questions architects had about composites—such as their flammability and how to navigate building codes that have not yet caught up to the structural capabilities of the materials. After the panel, some architects also expressed the additional challenge of convincing clients to try new materials. But architect and design educator John Nastasi brought a compelling dimension to the discussion when he made a presentation on the Sure House, a new direction in storm-resilient coastal housing that utilizes composite materials repurposed from boat building. Nastasi was in New Jersey when Hurricane Sandy hit in 2012, and he well remembers days without power and pumping sewage out of basements, followed by the subsequent tallies of the storm’s devastation: $29 billion in damage with 340,000 homes damaged. 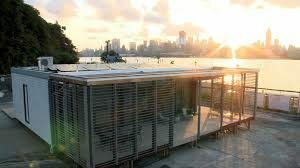 Nastasi and students at the Stevens Institute of Technology decided to face the reality of a future need for homes for middle-class people that reduce energy consumption while being built to withstand more extreme weather events. As Nastasi said, there is now a need in coastal design to do more than take grandmother’s house and raise it 16 feet in the air. Their solution is the Sure House, a Sustainable + Resilient home that was two years in the making, drew on students’ talents from eight departments, and became a winning entry at the 2015 US Department of Energy Solar Decathlon. The Sure House is 100% solar powered and uses 90% less energy than traditional homes. It can be closed and become a highly efficient envelope to withstand storm events. The house has a system of composite shutters, which can be opened to provide shade and house photovoltaic panels, but also closed as a skin to project the home against the weather. Nastasi tapped talents in the Rhode Island composites community to help students craft ingenious solutions to the design challenge–including those at Gurit, Henry Elliot and student Tom King at IYRS, and Ronstan for tensile rigging. According to Susan Daly at the Composites Alliance, this symposium is just one step toward building a stronger relationship between local architects and architecture students and the Rhode Island composites community. The event planted a seed—encouraging architects to explore the vast potential of composites as truly structural materials. Members of the Composites Alliance’s Architecture Subcommittee—including Holly Ashton of IYRS, Chase Hogoboom of Goetz Composites, and Daly—worked with AIAri to create the symposium. For any questions about the Subcommittee’s work, contact Susan Daly.